I received a product in exchange for this post. Sponsor is responsible for prize fulfillment. 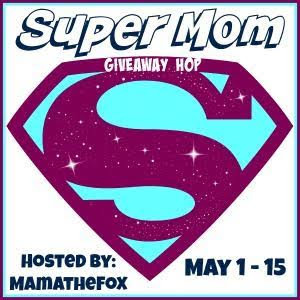 Welcome to the 2nd Annual Super Mom Giveaway Hop! This fun and exciting giveaway hop is brought to you by MamatheFox, The Kids Did It and The Mommy Island! Here at The Mommy Island, we're showing all the super moms and caregivers how much we think of them by indulging their sweet tooth with chocolate from Gourmet Gift Baskets! Learn more about all the delicious Mother's Day gift ideas from Gourmet Gift Baskets and enter for a sweet package below. Looking for a unique gift idea for Mom? Gourmet Gift Baskets are just a click away! From humble beginnings, they started this business in the basement of a flower shop and grew Gourmet Gift Baskets into the multi-million dollar business it is today. This family owned business never stopped their pursuit of the best ingredients and dedication to quality. Enter The Springtime Sampler Giveaway! 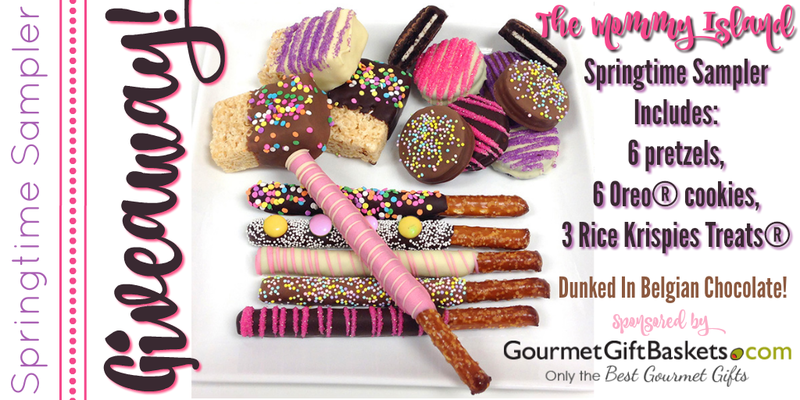 One lucky entrant selected by the entry form will receive the Springtime Sampler from Gourmet Gift Baskets! (ARV $45) Open for entry from 5/1-5/15/17 at 11:59 pm EST. Open to readers in the US, 18 years and older. The winner will have 24 hours to respond to the notification email to claim the prize or a new winner will be selected. The Mommy Island is not responsible for prize fulfillment. This Mothers Day there are so many options for gifts to give! At each stop in this giveaway hop you will find a prize that will be perfect for a mom in your life. Don't forget to check out MamatheFox's Grand Prize of (1) Kuhn Rikon Duromatic Micro Microwave Pressure Cooker, (1) Kyocera Ceramic Coated Fry Pan Set 8” and 10” and (1) Capresso Infinity Conical Burr Coffee Grinder and (1) bag of Capresso’s Grand Aroma Coffee Beans - Regular Roast! This Grand Prize is valued at $266! MamatheFox, The Mommy Island, The Kids Did It and all participating blogs are not held responsible for sponsors who fail to fulfill their prize obligations. I would love to get the I would love to get the Love for Mom Cookie Gift Box! Another basket I'd like is the Mother's Day Chocolate Gift Basket! I love the variety of chocolate, it looks so yummy and perfect for anyone who loves the sweets! I would also love to have the Premium Spa Wine Gift Basket. I really like the 19th Hole - Golf Gift Basket, too! I also really like the Mother's Day Orchard Fruit Basket. It looks really nice! I really like the Treats for Mom Gift Tower. I would like to have the Mother’s Day Gift Basket - Breakfast in Bed. I love their Gourmet Chocolate Basket. I really like the Love for Mom Cookie Gift Box. Both my mom and I would love this! Fruit, Gourmet Cheese & Cracker Basket Looks perfect. The Meat & Cheese Sampler would make a good gift for a friend of mine. I would love to surprise my man with the 12 bottles of beer.. The Mother's Day Orchard fruit basket looks wonderful too. Their Turtle Cheesecake looks amazing! The love for mom cookie gift box looks amazing! I like the Birthday Care Package -- this would be terrific to send to my son's apartment. I like the Mother's Day Wine basket everything a mom needs. I'd like their happy mother's day gift basket! I like the Love for Mom Cookie Box. I also like the Treats for Mom Gift Tower. I also really love what comes in the Exam Cram Care Package, I don't have any exams but I'll take the candy! I would like to try the All My Love Cheesecake Bites. I love the Birthday Care Package! The happy birthday strawberries and brownie pops are super cute! I'd love that for my birthday! I like the Happy Mother's Day Gift Basket. I like the Happy Anniversary cookie cake! I would really enjoy the All Fruit Basket...healthy and delicious! I like the Junk Food Care Package. Thanks. I would like the Mother's Day wine basket! I like the 3 wine basket! Any Mom would love the Coffee & Chocolates Gift Basket Classic. I like the New England Breakfast Gift Basket Deluxe too! I like the Love for Mom Cookie Gift Box. I would like the Chocolate Gift Basket Classic. The Treats for Mom Gift Tower looks wonderful! I really like their President's Choice Cheesecake Sampler. I would love to try the All My Love Cheesecake Bites. They sound delicious. I am from a family of coffee lovers so the Coffee Break Gift Basket sounds awesome!! I like the Hole in One golf basket. I like the Classic Spa Gift Basket also. The New England Breakfast Gift Basket Deluxe would be a fun basket! I like the Fruit and Healthy Snacks Gift Basket. I'd love the Chocolate Popcorn Sampler! Yummy! I like the Mother's Day Wine Gift Basket! I like the Mother’s Day Gift Basket - Breakfast in Bed idea. The Coffee & Chocolates Gift Basket Premium looks spectacular. I like the Mother’s Day Gift Basket - Breakfast in Bed also. Snacks for my sweetheart would be a fun one to send to my husband at work! I would really enjoy the Belgian Chocolate Dipped Apples. I love the Gourmet Chocolate Basket too. Spring Seasonal Beer Bucket would be a great gift for Father's Day. Beer and a backyard BBQ is a favorite tradition. I really like the Champagne & Truffles Gift Basket. I'd love the Sugar Free Basket for my mom and as a mom i'd love the wine trio! I liked the mom's dinner basket ! I would be in heaven to get the President's Choice Cheesecake Sampler delivered to me. I love the coffee gift basket. I like the Ladies Tee Time Mother's Day Golf Gift Basket. I would like the The Critic's Choice Gourmet Popcorn Sampler. I love pop corn and this has a nice variety. I like the New England Breakfast Gift Basket Deluxe too. I also think the President's Choice Cheesecake Sampler looks good. I would also like the Snack Gift Basket - Classic. I really like the Bountiful Harvest - Fruit Gift Basket. I like the Salted Caramel Popcorn for Mom tin. I like the Bath & Snack Gift Basket. I would love to get the Mother's Day Chocolate Gift Basket for my family! I would love the Coffee & Chocolates Gift Basket Premium! Father's Day Sauces & Snacks for The Grill Master is nice for Fathers Day! The Ultimate Dom Perignon Gift would be amazing to try. Perhaps if I win the lottery, I'd buy it for myself to celebrate. Love the Snack & Chocolate Gift Basket! Margarita Madness Gift Basket would be the perfect gift basket for summertime. Would love to try the let them eat cake popcorn mix! I like the mother's day chocolate gift basket. I would love the Classic Champagne gift basket. I really like the Treats for Mom Gift Tower too. The love be for mom cookie gift box looks like an amazing gift. I like the Mother's Day Bath and Snack Basket. It looks really nice & Mom could have a nice relaxing bath. I would love the From The Bakery Gift Tower!